A lifelong retailer, Author of the #1 Bestseller: The Retail Handbook, qualified accountant and Blockchain leader; helping to develop, and understand, the new technologies transforming Retail, CPG and supply chain businesses. 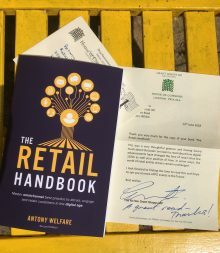 Being born into a retail family, and working since a young age, has given me an insatiable desire to grow, develop and nurture business and change within business. The world is transforming at an ever faster pace and keeping track of the latest technologies, inspires me to learn more, and help others understand the transformational impacts of these technologies. I started my research into Blockchain in 2016 and have learnt more than most about the technology and it’s impact and business and society. I am a Blockchain advisor to the UK Government, a lecturer on UCL Executive Blockchain programme, Judge and Retail advisor for Blockchain Live, run the Retail Week Technology blog for Oracle and Blockchain speaker at many events including Tech:Retail week. I focus on the Retail and supply chain use cases for Blockchain, and other complementary technologies such as IoT, AI/ML and RPA. My experience in Blockchain has led me to inspire hundreds of people, on the future of Blockchain, so that together we can learn how this technology will transform our lives. I have spoken at many events in the UK, Europe and Canada to all people interested in Blockchain and the transformational opportunities it gives. Blockchain in a Digital World, Proudly powered by WordPress.